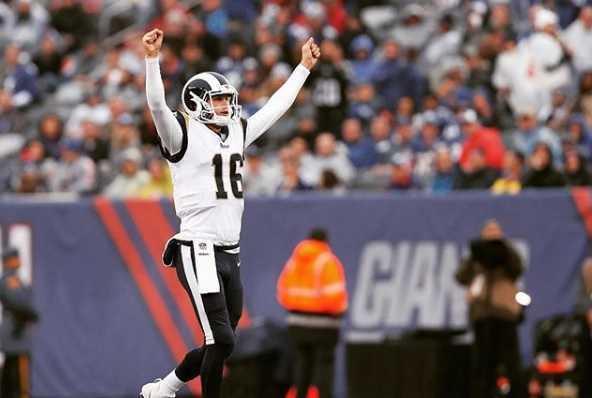 Jared Thomas Goff famed as Jared Goff is an American football player who plays as quarterback for the Los Angeles Rams of the National Football League (NFL). He was selected by the Rams with the first overall pick of the 2016 NFL Draft. He played college football at California. He was awarded PFWA Most Improved Player of the Year in 2017. The Rams quarterback Goff's performance in last three matches has become a serious concern to the Rams. In a match against Philadelphia Eagles last night, Goff fumbled losing the ball to Philadelphia Eagles and suffered a home loss, that nobody ever expected. His recent performances have raised many questions about his form which has affected the Rams end game results. The Los Angeles Rams have been going through tough days as they have lost more games in the last eight days than they did during the first 13 weeks of the 2018 NFL season. The Rams are struggling to get back their forms as they have already lost back to back two games. Goff was born as Jared Thomas Goff on 14 October 1994. He was born to Jerry Goff and Nancy Goff. He was born in Novato, California in the United States. He holds American nationality. He has an older sister, Lauren Goff. His zodiac sign is Libra. He belongs to White ethnicity. Goff attended and graduated from Marin Catholic High School in Kentfield, California. He played for the Marin Catholic football. He attended Univerisity of California, Berkeley, where he graduated in sociology. Several colleges offered scholarships to Goff. He chose to attend and play college football for the University of California, Berkeley. He became the first true freshman quarterback in Cal history to start a season opener. He set a new Cal single-game record with 542 passing yards in a victory over Arizona State. He set a new Pac-12 single-season passing-yardage record, 4,714 and conference record for touchdown passes in a season, 43. He earned first-team All-Pac-12 honors in 2015. Goff forgo his senior season at California to enter the 2016 NFL Draft. 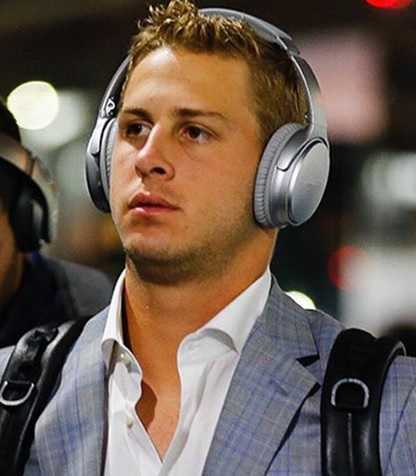 Goff was selected with the first overall pick by the Los Angeles Rams in the 2016 NFL Draft in April 2016. Goff signed a 4-year contract with Rams for $27.9 million, including $18.6 million signing bonus. He made his professional debut against Miami Dolphins in November 2016. He made seven starts in his debut season at Rams. He was named NFC Offensive Player of the Week during Week 9 against the New York Giants in 2017. Rams won the NFC West for the first time since 2003. In his third season, he threw for a career-high 465 yards, with 5 touchdowns, against Minnesota Vikings. He also set the record for most passing yards and attempts while maintaining a perfect passer rating, surpassing Ken O'Brien. He was named NFC Offensive Player of the Month for September. He has an enzyme deficiency. It does not allow a body to break down proteins, where the body cannot process red meat. Jared Goff stands at a height of 1.93 m i.e. 6 feet and 4 inches tall. He has a body weight of 101 lbs i.e. 101 kg. He has an athletic body build. He was signed by Los Angeles Rams for $27.9 million, plus $18.6 million signing bonus. As of 2018, his net worth is estimated at around $20 million. He was San Francisco 49ers fan growing up. He wears jersey number 16 as a tribute to Joe Montana of San Francisco 49ers. He was selected to the Pro Bowl in his second season at the Rams.